It's not just phones that can act as personal hotspots anymore. Sony's Vaio Z and Y series laptops will soon start shipping with Share My Connection (SMC), which turns your notebook into a MiFi for up to five devices. The service will be offered through Verizon, and you'll obviously have to pay extra for a data plan along with any other premium for the SMC feature itself. The real benefit here—since you've been able to do this on your own with software for a while—is that it's an out-of-the-box feature. And while you'd expect a premium add-on like this in the pricey Z series, Y series laptops start at a much more reasonable $770. 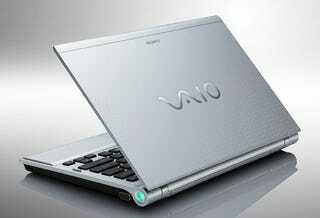 WHAT: The VAIO Z and Y Series PCs are the world's first out-of-the box laptops that act as a personal hotspot. Select models of these series feature the exclusive new Sony embedded wireless technology called Share My Connection™ (SMC). With SMC you can turn your laptop into a mobile wireless access point that can connect up to five other PCs or networked devices, such as smartphones, mp3 players, and cameras. A subscription is required. WHO: A perfect built-in network solution for business travelers, those on-the-go or anyone looking to save some money by sharing a single network connection, Share My Connection is secure and lets you extend your connectivity with coworkers, friends, and family members. The Z model offers premium portability and serious power. A breeze to carry at about 3.0 lbs, this PC features a durable carbon fiber and aluminum casing and delivers up to seven hours of battery life for true mobile freedom. It incorporates a 13.1-inch high-resolution LED backlit widescreen display, delivering a bright picture with 100 percent color saturation. The extremely thin unit also comes with an optical drive (Blu-ray optical drive optional). Just in time for back-to-school season, the Y Series laptops comes in five new exciting colors including purple violet, fuchsia pink, pear green, teal blue and black. With a thin 1.2-inch profile and 13.3-inch LED backlit widescreen display, the sleek Y model offers lower power consumption for improved battery life for that active student lifestyle. WHEN: Available now for pre-sale at www.sony.com/SMC and at select retailers around the country for about $770 for the VAIO Y Series and $1950 for the VAIO Z Series. To find the closest Sony Style store, please visit www.sonystyle.com.